Just in time for the holiday season, TOMS is releasing its first ever watch bands for the Apple Watch. Inspired by founder Blake Mycoskie’s friendship bracelets, these watch bans will be available during the holiday 2016 season to bring awareness to global light poverty. And as always, when you buy TOMS merchandise, there is also a charitable counterpart. This time, for every TOMS for Apple Watch band purchased, the company will provide one year of solar light to an individual in need. About 1.2 billion people lack access to safe and reliable electricity, which negatively affects their income, health and well-being. This initiative will not only provide light, but will positively impact education, economic opportunity, health, and safety for these households. Education: Solar light allows for additional studying time after the sun goes down. Economic Opportunity: Families can save an average of 10% of their household income by using solar lights rather than paying for alternative light sources. Health: Solar light improves respiratory health by eliminating the need to burn kerosene or paraffin within the home. Safety: Solar light decreases the risk of fire and provides light for travel and necessary tasks. The Environment: Solar light reduces emissions of C02 gas. TOMS has partnered with two Giving Partners, Solar Sister and Solar Aid, two companies whose missions are to provide solar powered light to homes in Africa. These partnerships are formed to ensure that individuals have access to safe, reliable light sources so that one more child will have the time to study into the night, one more person will have the time to work after dark and earn extra income, and one more family will stay healthy and safe. Available at www.TOMS.com and TOMS stores across the U.S. The Utility Collection, a classic look designed for travel and adventure, features premium, durable grosgrain fabric strap and genuine leather detailing. Available in eight colors. The Artisan Collection, inspired by TOMS Founder Blake Mycoskie’s collection of friendship bracelets from around the world, features woven fabric and genuine leather backing. Available in three colors. 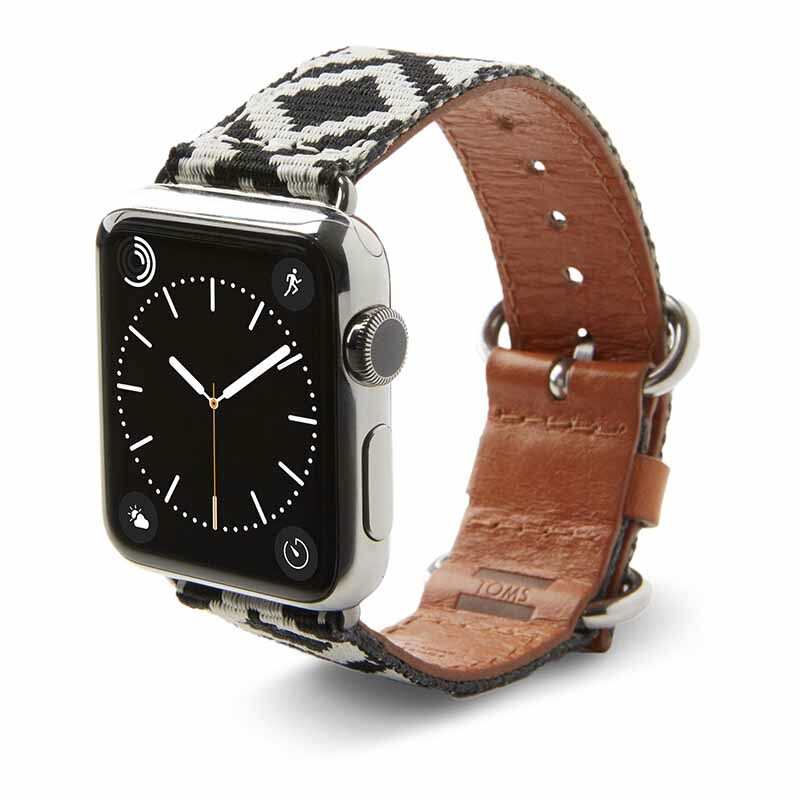 All TOMS for Apple Watch bands feature a “GIVE TIME” etching and a gold “TOMS” emboss, as well as genuine leather and stainless steel details for a timeless finish. 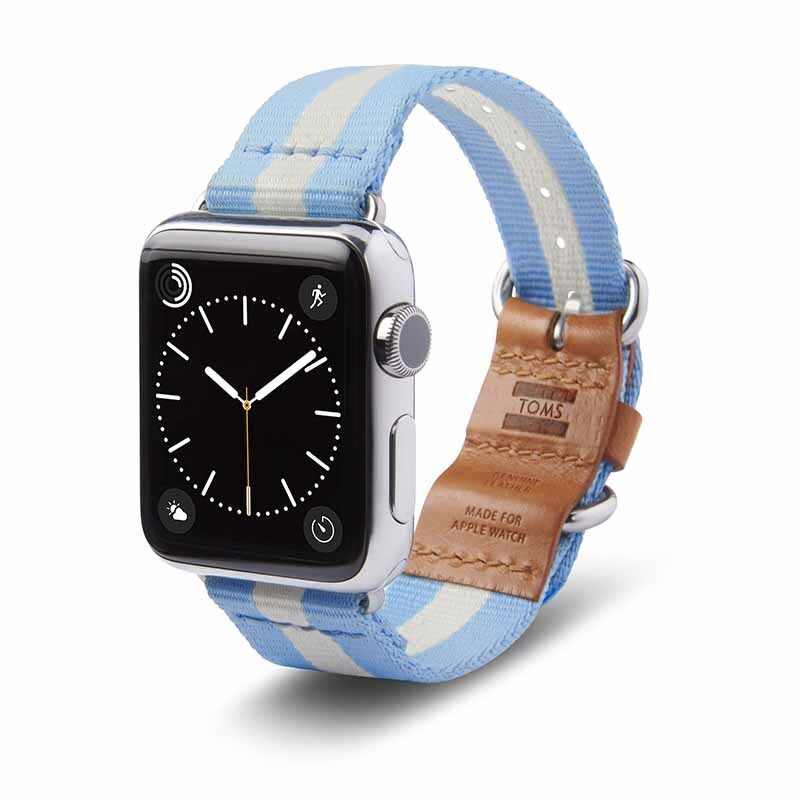 TOMS for Apple Watch bands are available in three different styles in several color ways. Pricing for bands is $49 and $75, respectively.